where do I start ,or maybe better, where do I stop? I have nothing on the ugly side. I like my Bakers Rosin. I seem to use little and there seems less dust. I like Magic rosin but that stuff is sticky and I feel tt builds up on strings, which isn't a big deal. 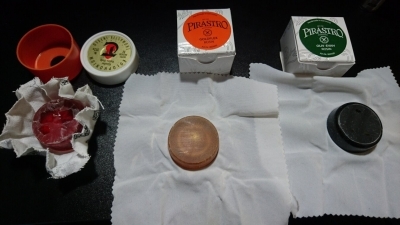 I even have tried simple red box rosin from ebay that is cheap (less expensive) It all seems to do the trick for me. I use Hill Dark rosin for my viola, and Hill Light on the rare occasions I play violin. No particular reason for the brand, other than that Hill Light was recommended to me (for violin) by a friend before I switched to viola, and Hill Dark was recommended by the luthier when I got my first viola. They seem like standard mid-range rosins, good quality but nothing fancy. I will note that light rosin isn't quite grippy enough for viola strings, especially the G and C strings. Dark rosin can sound scratchy on the violin E string. One thing I like about the Hill rosins, as compared to the cheap wood block rosin I started violin with, is that it the Hill rosins don't produce a ton of dust. With the dark rosin, in particular, you also don't have to use much of it: just three or four bow strokes across the rosin cake are all I need for 6-8 hours of playing. Just to add my 1/4 cents... I've been using a "generic" box rosin for several years, but recently bought the FM Holstein Premium Rosin and have been happy with it. I doesn't leave as much dust at the box rosin, but both seem to work well (except I like the container the Holstein comes in better than the box type). I'm using FM's rosin with the magnetic top. I use very little every other day. I have 3 pieces of 'quality' rosin - meaning ones that actually have a brand name on them :)) - and a generic box only labeled 'Rosin' that came with my cheap violin outfit. The generic one is a light rosin and it's pretty much awful, though it does the job. The awfulness comes from the fact that it sticks to the strings very easily and forms a 'caramelized' like layer on them that you have to rub hard to get rid of. So it's not just dust, but an actual hard layer of stickiness on the strings which amplifies scratchy sounds if not removed. All 3 are decent, the Thomastik is a nice all-around thing that I threw in my case and rarely use, mainly due to the fact that it comes in a plastic box with a thick piece of cloth inside and the rosin cake, all of which are separate (nothing is attached to the cake or box) so you have to either hold the cake itself or grab it with the cloth and try to not drop it. It has little to no dust and a pretty strong grip. The Goldflex was my favorite before I got the Oliv. I noticed it gives a nice ring to the sound and has a medium grip so everything is sort of 'smooth' with that one, but it being a lighter rosin produces a lot of dust. I love seeing the rosin collections.. the idea of having more rosin than one could use in a lifetime.